Do your PCs start as strangers meeting in a tavern? There’s nothing wrong with this, if it works for your players, and you have a method for communicating adventure leads (a rumor table is the traditional mechanism). Here is another approach, if you (or your players) would like PCs to have a reason to work together, other than a burning desire to get rich or die trying. Roll (or select) a party background from the table below. Each player then needs to figure out how their character fits in. This need be no longer than a sentence. I have used this method successfully several times. 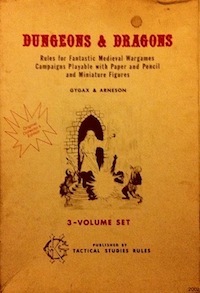 For example, in the Blackwater Falls campaign, the PCs were all inheritors of the archmage Wolfgang Constantine’s mansion (including the catacombs beneath). In my current game, the PCs are the second generation of a higher-level established adventuring company (the first generation went missing in the first session, so the PCs are left to figure out what happened, and deal with any loose ends, including outstanding adventuring commissions). The point of these backgrounds is to open up possibilities for the PCs, rather than to funnel them into one obviously right course of action. They can also motivate recurring costs, the satisfaction of which can easily drive adventuring. For example, the PCs in the Blackwater Falls game also inherited the archmage’s considerable debts. This is actually, in my opinion, one of the most open-ended ways to structure PC challenges: the PCs have a problem (in this case, debt service, but the problem could just as easily be evil ninjas that want their secret manual back) and they need to figure out how to solve it. There is no right answer. They can try to accumulate GP to pay off the debt collectors. They can kill the dept collectors and deal with the consequences. Many of the entries in this table have an element of looming or ongoing danger. This opens up some interesting referee challenges and opportunities. Challenges, in that you probably don’t want to decide beforehand what is going to happen. That’s boring for the referee and unfair to the players. Opportunities, in that you have more fodder for adventures. This element of the background story can function as a temporal version of a wandering monster check. Before play, you should write up a chart of things that could happen, and then every (in-game) day, (or whatever increment of time makes sense), roll a wandering plot check. 1 in 6 causes one of the events or encounters on the table to occur. This is yet another way that good timekeeping can help drive the game. The danger is, of course, that players just wait for the next “wandering plot” encounter. The key to avoid this is to making the encounters unprofitable in the same way that wandering monsters are unprofitable and avoided by skilled players. Also, you don’t need to explain the mechanic. This table is just a proof of concept and is by no means complete. PC Party Background. Roll d12. Shipwrecked! PCs thrown together by circumstances. Inspiration: Lost. Trapped in a haunted house. This could also be a ship or other kind of vehicle. You will need to think of a reason why they are all there to begin with. Escaped prisoners. Fairly or unfairly accused? In any case the PCs better work together or be captured by the authorities. Ex-slaves. Raised from birth by a mad genius? Super soldiers whose mind-control devices malfunctioned? Escaped slaves or freed slaves? Some slaves could have been left behind, clear adventure fodder (and a source of new PCs if you want to maintain the origin story). Boomtown! Some valuable resource (maybe a dungeon?) has been discovered. This is similar to a conventional “start in the tavern” game, but you can also add something like employment by an business which specializes in dungeon delving. You can also emphasize the frontier, town-building aspect (which can also make resource management more important). Inspiration: Deadwood. Second Generation of an Adventuring Company. The PCs need to deal with all the enemies the first generation made, and all the intrigue that goes along with it. The first generation may now be masters of a stronghold, or may not have reached name level yet. Traditionally, the first generation would have also been PCs at some point, but this is not required. Servants of Chaos. This need not be a party of evil characters. A job’s a job, right? You just happen to work for a red dragon. Or whatever. Explorers! Maybe you have a charter from the Resident Authority Figure to map the unknown, like Lewis and Clark. Or Star Trek. Party may have a vehicle of some sort; be careful with map scale here as old school D&D is primarily a game of exploration, and vehicles might allow them to venture farther and faster than you expect, making it hard to avoid the quantum ogre effect. Privateers. Bandits or pirates that can operate legally (because they prey on an enemy of the state). Rebels! Members of a resistance front against the evil oppression of X. Inspiration: Star Wars, Robin Hood. Black-ops. Covert team for lord or other powerful figure. Or some wizard’s apprentices & henchpeople. PCs get missions and may be paid. Inspiration: Mission Impossible, Charlie’s Angels. Ex-black-ops. You and your friends know too much. Or The Organization thinks you do. Or maybe they just have to downsize, and need to clean out the old file cabinets, as it were. Or The Organization was wiped out and the only survivors are the PCs. Inspirations: Burn Notice, Red. Quests are problematic as the basis of an entire campaign, unless you are running a mini-series type of game that you expect to end once the quest is fulfilled. Because of this, you will notice that there are no quests on the table above, because they don’t really work well in a sandbox context. Once the quest is done, the logical reason for the adventuring seems to end (The Hobbit: retake Erebor and reclaim the dwarven treasure; Lord of the Rings: destroy the ring). You can just keep pushing back the completion of the quest artificially, but that makes player choice less meaningful (for example, in Inuyasha, there is always one more shard of the magical Jewel of Four Souls to collect). Not recommended, unless the quest is peripheral to the driving force of the campaign as a whole. This entry was posted in Techniques on November 9, 2011 by Necropraxis.